Following a run of insipid away performances, we witnessed a much better one at Bramall Lane. Rather than looking like a team that had come to defend, Wigan Athletic attacked Sheffield United from the start. There was pace, there was balance, there was ambition. The problem was that the home team had Billy Sharp and his hat trick destroyed Latics after Chey Dunkley’s own goal had given the Blades the lead. Sharp is hardly an Aguero or Kane. He has played just two games in the Premier League, those being for Southampton six seasons ago. But he is a very experienced Championship level striker and scored 13 goals in 34 appearances last season for Sheffield United. He gave Wigan’s centre backs a torrid time yesterday, scoring three opportunist goals. Paul Cook decided to stick to his usual 4-2-3-1 formation, bringing back Nathan Byrne and Gary Roberts on the wings, replacing Cedric Kipre with Dan Burn, with Callum Connolly moving inside the unavailable Lee Evans. There has been a dramatic drop for Latics in the month of October with a record of W1 D1 L3. Over the course of the season so far so many games have been somewhat naively thrown away or lost tactically. But at the same time, one must give immense credit to Paul Cook for the positives. He had a whopping challenge in losing the Burn/Byrne brothers at beginning of season, having to bed in a new defence, followed by injuries to key attackers Grigg, Jacobs and Massey interrupting form. Despite recent results Latics are in a respectable 14th place, 8 points clear of relegation. Moreover, the table is so tight that two wins (or losses) can cause a dramatic rise or fall. Cook was also without Lee Evans yesterday. Evans is a quality player in every aspect except speed/acceleration. He is tactically aware, quick thinking, has vision and an excellent technique. He was sorely missed, not least in the quality of his kicks from set pieces. This is a season of consolidation for Latics. The squad is probably not strong enough to get into a playoff spot but is certainly good enough to avoid relegation. Were they to finish the season in this current 14th place it would be regarded as a success. Following an awful display at Millwall, where the hoof was the main form of attack, yesterday’s performance was breath of fresh air. The manager selected a balanced lineup and Latics played some very good football at times. Wigan have had some difficult fixtures of late and injuries have restricted the manager’s team selection. It is the manager who takes the flak when the players don’t deliver. Cook is never one to blame the players and he rarely gives excuses. He deserves credit for getting Latics into their current position with a third of the season gone. Gary Roberts’ hamstring pull after 35 minutes signalled the end of the game for him, with Kal Naismith replacing him. He joins Will Grigg, Michael Jacobs and Gavin Massey on the hamstring injury list. It is a worrying trend: fans are asking if it is something associated with the players’ physical preparation. Or is it merely a coincidence? Nick Powell’s departure with an ankle injury on 66 minutes was particularly worrying. He had to be helped off the field with a man on each side supporting him. If Latics have one player they cannot afford to lose for a long period of time, it is Powell. The exclusion of Kipre for Burn was a bold move by Cook, who maybe thought Burn’s experience would be more important on the day. But although Burn and Dunkley played so many games together last season, this was their first pairing as central defenders this season. It showed as they both struggled against the aggression and movement of the home team’s attacks. But given their lack of game time together this season it was perhaps understandable that they were not the cohesive unit we saw in League 1. Moreover, in his post-match comments Cook alluded to the lack of protection the defence might have received. Following Callum McManaman’s introduction on 66 minutes for Nick Powell, Cook put Nathan Byrne at right back, pushing Reece James into a midfield holding role. The hapless Callum Connolly had been taken off 8 minutes earlier. James is a fine all-round footballer and he looked immediately comfortable in that role, making himself available to receive the ball, using it effectively. It has been a difficult season for Byrne, suffering injury problems and not being able to regain the right back position due to the excellent form of Reece James. However, Byrne can still have an important role to play this season. Byrne made a welcome return against West Bromwich playing on the right wing. He was rested for the Millwall game but brought back to the right wing yesterday. He was arguably Latics outstanding player, linking up well with James and providing the assist for Kal Naismith’s goal. Later in the game he was moved to his more customary position at right back, with James pushed into midfield. With Gavin Massey due to be out for a long period of time, Byrne will most likely be the main contender for the right wing spot. Moreover, his presence gives Cook the option of bolstering his midfield in the latter stages of games by switching James’ and Byrne’s positions. What an uplifting performance and result! Latics fans had been so down in the dumps following a dismal performance at Preston, but this rousing display has once again lifted spirits. The augurs did not look good for Paul Cook’s side, with Will Grigg and Michael Jacobs joining Gavin Massey on the “major hamstring injury list”. There was a certain amount of doom and gloom prior to the game and Cook’s team selection looked uninspiring. It was no surprise to see Dan Burn come in for Antonee Robinson, but the selection of Nathan Byrne and Gary Roberts on the flanks, at the expense of Callum McManaman did not impress. But the end result was that Cook’s team selection and tactics worked in securing a win over a team whose wage bill dwarfs that of Wigan. It took a moment of opportunism from Josh Windass after 74 minutes to bring home the three points, outpacing a central defender following Nick Powell’s flick-on header. His finish was resolute. West Bromwich had dominated the early possession and looked the more threatening, but as the game unfolded Latics looked the more dominant attacking threat. Moore was largely accurate in his appraisal of the game, although most neutrals present would have most likely said that on the balance on things, Latics deserved their win. 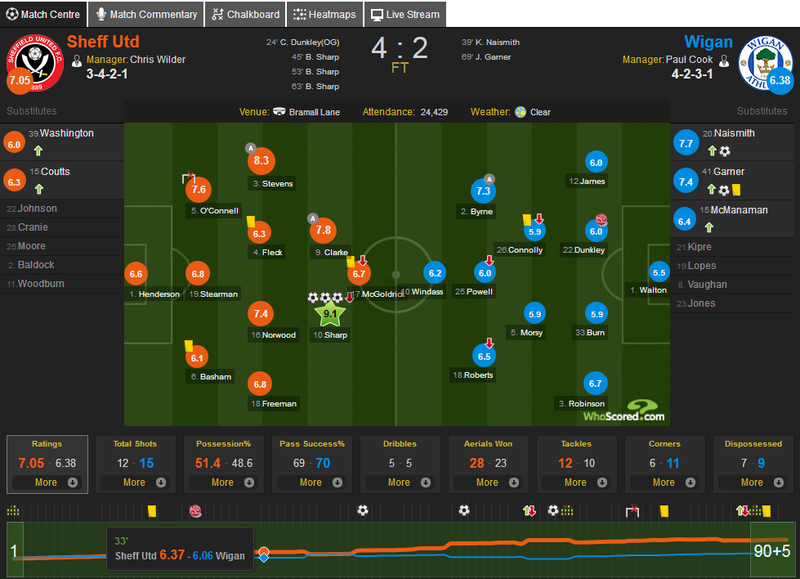 When Wigan lined up it looked like the regular 4-2-3-1 formation that has been the norm in Cook’s tenure. However, the two central defenders were switched with Kipre put on the right side and Dunkley on the left. West Brom’s front two of Dwight Gayle and Jay Rodriguez had already scored 15 goals between them, one goal more than Latics entire team had mustered up to that point. But following a tough time at Preston, Wigan’s centre backs rose to the occasion and kept Gayle and Rodriguez on a short leash. Kipre had what must be one of his best performances for Latics and Dunkley once again showed his mettle. It looked like Cook had given Windass the opportunity to play in the lone striker role, but as the game progressed we would see he and Powell exchanging positions. It proved to be a masterstroke as the opposition defence found their movement hard to deal with. Moreover, the synergy between the two gave us a glimpse of a fine partnership developing. Josh Windass had looked like a duck out of water playing wide. Given the opportunity to play a more central role he looked a fine player, industrious, intelligent in the timing of his runs, a headache for the visiting defence. 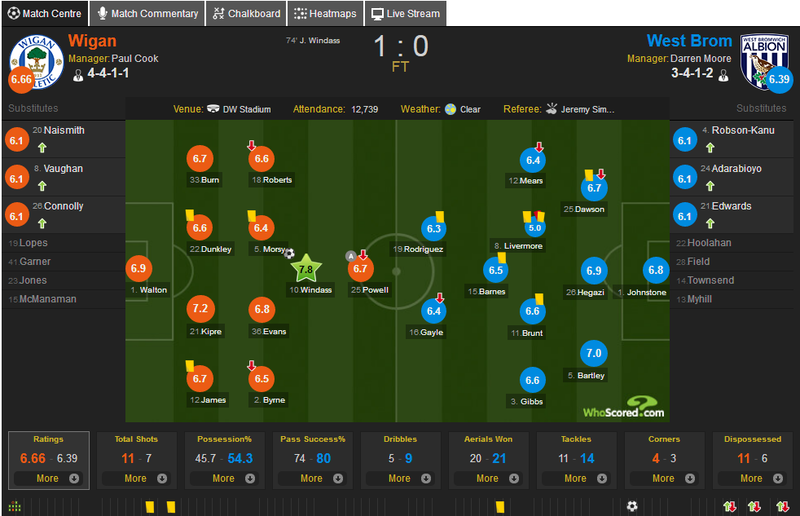 Windass had 6 shots, with 3 of them on target. Given Latics’ shot-shy record in recent games it was refreshing. Seeing the way Windass linked up with Powell one could get a glimpse of Cook’s belief in the player. But Cook still has Garner, Grigg and Vaughan fighting for a striker position, which will be a dilemma for the manager. Another line of thought is that Windass was signed as a back up for Powell, should he leave in January. Powell’s continued tenure at Wigan will depend on the stance of the new IEG owners, when the takeover happens, assumedly in November. Where would this current team be without Powell’s superb build-up play and his ability to score and assist in making goals? Roberts has prior experience at Championship level and he looked a class act. Although 34 years old and with just 7 minutes of second tier match play behind him this season he worked hard for 89 minutes, putting in finely weighted passes and crosses. He has not been the most popular of players with Wigan fans, the cynics regarding him as an old pal of Cook’s from Chesterfield and Portsmouth. Indeed, questions were asked as to why someone at this stage of his career would be offered an extended contract. Roberts has never been particularly fast. If he had been he would have played in the top tier. But last season’s stats reportedly suggest that when he was involved he covered more ground than most of his teammates, with a sweet left foot to match. He got a merited ovation as he left the DW pitch yesterday. Reece James was once again excellent yesterday. Although only 18 he is the complete full back, strong in defence, skilful in attack, but more than anything else he has a great football mind. Barring serious injury or calamity he looks destined to be the regular right back for England. Media reports tell us that Brighton will make a £10m bid for him. But would Chelsea seriously consider such an offer for a player of his level? Admittedly the Chelsea academy produces so many fine players whose chances of first team selection are minimal, but James is something special. Should Brighton get him at that price it would be a bargain. Millwall lie in 22nd position, with just two wins so far, but at home they have beaten Derby County and Aston Villa and drawn with Leeds United and Middlesbrough. A trip to the New Den has never been easy for Latics and their away form has been unimpressive of late. Moreover, Latics have an inferior record in games against Millwall. Barring injuries, Cook is likely to name an unchanged line-up. What Latics can expect is a fight on their hands. Do the players who played most of the game against West Brom have the energy and determination to fend off a side that has had difficult home fixtures so far, but has an intimidating support? It might not be pretty, but Cook’s men must be ready to slug it out with the home team. The complacency we saw at Preston could lead to calamity. Bill Shankly’s quote maintains its powerful message. 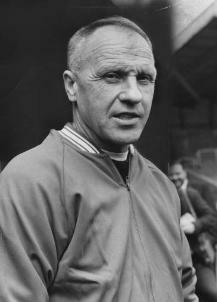 He was not everybody’s favourite and his teams played a pragmatic brand of football, but he was a great motivator and he laid the foundations for Liverpool’s successes in the 1970s and 1980s. Paul Cook demonstrated in the 2017-18 season that he too is a powerful motivator. The passion and commitment of his League 1 title-winning team is a testament to that. The ecstasy of the players and the traveling support alike, at winning the League 1 title with a narrow victory at Doncaster, showed what it meant. As Shankly said: a lot of football success is in the mind. Can Cook can put success in the minds of his players next season? But then again, what kind of squad will the manager command in 2018-19? Can Latics consolidate in the second tier following the mistakes of 2016-17? It was a relief to hear that Paul Cook has signed a new four-year contract. We, on this site, welcomed Cook’s appointment in an article of May 2016. We remain convinced that he is the right man to lead the club forward. It could be said that with the quality of squad at his disposal, with a playing staff budget around three times the norm in the division, promotion was an expectation. But it was not so much the promotion, but the positive style of play that impressed, with more goals scored than in any season in Latics’ 40 years in league football. Cook has never managed a club above the third tier and next season will be more of a challenge for him. Moreover, the financial circumstances will be totally reversed. Instead of having one of the biggest staffing budgets in the division, Latics will have one of the smallest. However, the length of Cook’s new contract suggests that the club will stick with him if the going gets rough in the transition to the Championship. Two relegations in four years happened largely because managers were sacked prematurely and replaced by others whose approaches were not only inept, but who favoured “fightball” rather than football. These lessons of the past need to be heeded. There was talk of the takeover by the IEG as early as December, then again in February. But now it really does seem imminent. Reading between the lines of recent documentation it appears that the IEG will provide some level of funding for the playing staff over the summer. That is backed up by media reports that Latics have offered £500,000 for left back Dan Potts of Luton Town. To gain promotion back to the Championship Wigan had to take a substantial financial loss over the season. With a salary bill of some £10m and revenues less than half of that, David Sharpe supported his manager by retaining a backbone of ex-Championship players on salaries well above League 1 norms. Some have said that promotion was a pre-requisite for the takeover. We can assume that the losses incurred have been priced in to the sum to be paid to the Whelan family by IEG. IEG will surely be aware that it is going to cost them money just to keep Latics in the Championship. Brentford are a club with similar revenue capabilities to Wigan. Since buying the major shareholding in Brentford in 2012, it is estimated that Matthew Benham has put £100m into the club. Benham hopes for the club to be self-sustainable, but with low attendances and commercial revenues it is a challenge. The aim is for a streamlined recruitment policy to provide a steady stream of revenue with through incoming transfer fees. Player recruitment at Wigan has been hit-and-miss over recent years, with so many “up and coming” players not making the grade and being dispatched away on loan. However, recruitment last summer was more effective, with seven senior squad players picked up for free and loan players playing key roles over the course of the season. The sale of Omar Bogle in summer raised around £700,000 but undisclosed fees were paid for Devante Cole, James Vaughan and Jamie Walker in the January window. IEG have indicated that two individuals from the current hierarchy at the club will be staying on in the transition. David Sharpe previously stated that he was hoping to stay on, but nothing has been confirmed at this stage. Garry Cook had been brought in to sell the club and may be departing shortly. The continuance of Chief Executive, Jonathan Jackson, also remains to be confirmed. Following the sad news of the departure of Luke Burke from the club, we found out that another four were not being offered new contracts. Donervon Daniels (24) and Reece James (23) were first team regulars in the promotion season of 2015-16, but long-term injuries prevented them appearing in the Championship. Daniels was sent on loan to Rochdale in summer, being recalled in January, but went on to make only one appearance by May. James came back from injury and was playing possibly the best football we had seen from him before he was left out in early March. He did not reappear, although fit. Andy Kellett (24) had had his fair share of injury niggles before being sent on loan to Chesterfield for the season. Sam Stubbs (19) had shown lots of promise in the pre-season, but was sent on loan to Crewe, where he made 3 starts, then to AFC Fylde where he made 6. At the same time as reporting who had not been offered new contracts, the club announced that five players would be given offers. Of those, Jamie Jones (29) has already signed an extension and it was today announced that David Perkins (36) has been signed by Rochdale. Gary Roberts (34), made 6 league starts and 21 substitute appearances last season. Noel Hunt (35) did not make a league start but made 7 appearances off the bench. Alex Bruce (33) made 4 starts and 2 substitute appearances in the league. In most football clubs it would raise a red flag to see five players below the age of 25 not offered contract extensions while the same number of players approaching or well over the age of 30, none of whom were first choice starters, being given an opportunity to stay. However, it has been a peculiarity in the tenure of Cook as Latics manager. But Cook’s admirers will say that the manager built a strong young team, many of whom can serve the club for years to come. More senior players were confined to bench-warming at best but played an important role as squad members. Knowing the way Cook had deployed his forces during the season it was therefore no surprise to see such a retained list. It is rumoured that Paul Cook wants 5 or 6 new players for his squad. But his immediate challenge will be to deal with a scenario whereby so many senior players have contracts that end in June 2019. They include regulars Dan Burn, Nathan Byrne, Gavin Massey, Nick Powell and Max Power, together with Ryan Colclough, Jordan Flores, Josh Laurent, Craig Morgan and James Vaughan. Cook will doubtless want to keep his key players through offering them contract extensions. Much will depend on the willingness of the club ownership to meet increased salary demands and commit to longer contracts. Should the contract extensions not be agreed we can expect those players with significant market value to be departing over the summer. Moreover, we can expect movement from some of the “fringe” players. Loan players had a significant role over the course of last season and we can expect more to come. Lee Evans was excellent before his departure to Sheffield United in January, but Christian Walton and Callum Elder went on to establish themselves as regular starters. Whether the latter two return to Wigan on permanent contracts depends on the demands made by their parent clubs. The bottom-line for Cook will be to keep the backbone of his squad together but bringing in new players who genuinely are “up and coming” or who have experience in the top two tiers of English football. Will a home-grown player come into the reckoning this coming season? Newspaper reports that Everton were interested in the 19-year-old Callum Lang caused ripples among Latics fans. Lang was a star for Latics at youth level and, after a slow start, managed to make an impact on a season-long loan in a struggling Morecambe team. He is a talented young player who can play as a target man or in the hole just behind the central striker. In League 2 he made 14 starts with 16 substitute appearances, scoring 10 goals. The departures of both Luke Burke and Sam Stubbs once again highlighted the failure of the club in helping talented youngsters to step up to the plate at senior level. Providing Latics can hold on to Lang, will he have a chance of establishing himself in the senior squad? Cook already has three central strikers in his senior squad in Devante Cole, Will Grigg and James Vaughan. Potential opportunities for Lang in that position would appear slim. The future of the academy is something that IEG will need to look at. There has been so much promise over the years, but so many of those young players have fallen by the wayside. Will we ever see another career trajectory like that of Leighton Baines? Do we show these teams too much respect? The words of Dan Burn after a disappointing performance. Prior to this goalless draw at the DW Stadium, Rotherham United had lost their previous three away games, conceding eight goals in the process. But they deserved not to lose yesterday. They packed the midfield, pressing Latics into making mistakes and their big lone striker proved a physical handful for the Wigan defence. Latics looked pedestrian, plodding along, not the dynamic outfit who had scored nine goals in the previous two games. Passes were misplaced, and the build-up was painfully slow. Although it was their third game in the space of eight days, once again Paul Cook resisted the opportunity to freshen up his pack and stuck with the same starting eleven. Thanks to a Bristol Rovers goal in the fourth minute of stoppage time, Latics remain on top of League 1, ahead of Blackburn on goal difference. 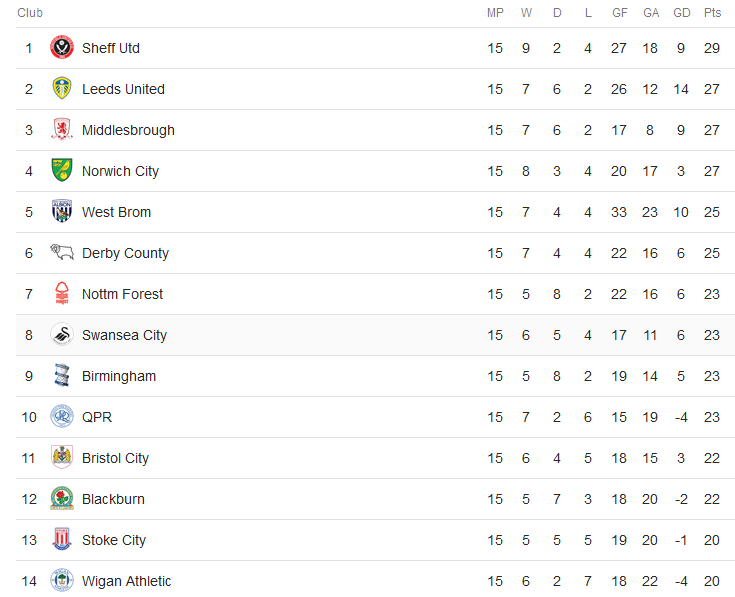 They are in pole position, with a game in hand to Blackburn and five-point buffer ahead of Shrewsbury. Latics have five games left: two at home and three away. Dan Burn emphasised the importance of not having lost to Rotherham, who remain in fourth place. His comment begs the question as to whether Latics were focused on not losing more than actually winning. It was the kind of performance that we have seen before in home games against teams from the top ten. In so many of them Latics have seemed unwilling to fully commit men forward, in fear of counterattack. At the DW they have beaten only one team currently in the top ten and that was a tight 1-0 win over Plymouth, who were bottom of the table at the time. On the other side of the coin, they have only lost one, that being against Blackpool prior to the Manchester City epic. They shared the points in the others, five of those being goalless draws. 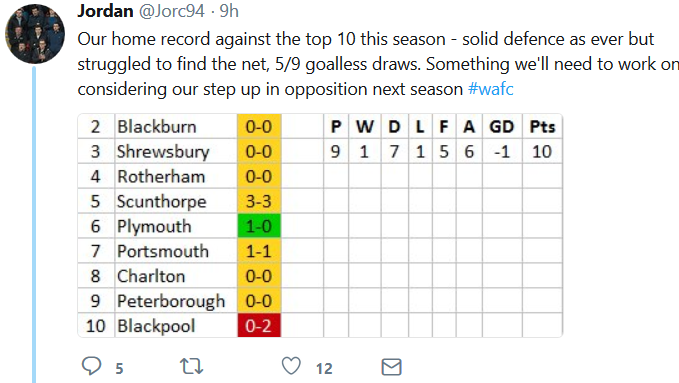 The counter-argument is that Latics are the prize scalp in the division and that visiting teams come looking for a draw, doing all they can to dull Wigan’s attacking threat. Most of Latics’ best performances this season have been away from home, where the opposition has had to show more attacking intent. The stats show that Wigan have picked up 44 points from 20 games on the road, compared with 43 points from 21 games at home. Against the top ten teams away from home they have a record of W4 D2 L3, whereas at home it is W1 D7 L1. Cook’s record last season at Portsmouth against the other teams who finished in the top ten makes interesting reading. Like Wigan their results against their closer rivals were not impressive. Pompey’s home record read W4 D2 L3, whereas on the road it was W4 D1 L4. They failed to score in two of those home games against top ten opposition. Yesterday Cook resisted the chance to bring on James Vaughan after half time for the injured Nick Powell, instead introducing Gary Roberts. Vaughan had teamed up with great effect with Will Grigg after coming on at Rochdale but Cook chose the more conservative option by making a like-for-like replacement. Cook was clearly concerned about losing further control in the midfield. Cook was obviously keen to pick up one point if he could not pick up the three. Wigan’s performance yesterday and in previous home games against top ten opponents begs the question whether too much respect has been shown to such opposition. But for the moment Latics are in a great position to consolidate their promotion to the Championship division. Cook deserves commendation for helping his team get to such a point with only three weeks of the season remaining. Thanks to Jordan for his revealing analysis on Twitter. Paul Cook was once again displaying that refreshing type of honesty that has characterised his interactions with the media. But with just one win in their last five league games, Wigan’s promotion challenge is faltering. We have certainly learned that Cook does not favour squad rotation, preferring to stick with a settled lineup. But with the fixture pileup Latics were facing we could have expected a little more flexibility from the manager. In the event he opted for just two changes from the starting lineup at Blackburn. The introduction of Reece James for Callum Elder was no surprise. Neither was the insertion of David Perkins for his first league start in six months in place of wide player Gavin Massey. Before the game started it looked like a conservative change. Massey’s recent form had been indifferent, but Cook had resisted the chance to put in either Ryan Colclough, Gary Roberts or Jamie Walker as a like-for-like replacement. It seemed like Perkins would play a wide midfield role. In the event, Perkins lined up in the centre-left midfield role, with Sam Morsy centre right and Max Power pushed towards the right flank. It changed the chemistry of Wigan’s football. With Nick Powell often dropping back to receive the ball, the midfield looked crowded, somewhat akin to what we saw in the era of Warren Joyce. With more men in midfield we could have expected Latics to nullify much of the threat from the opposition, but far too often Scunthorpe were able to find gaps which they could exploit. The midfield just was not able to provide the cover for the back four that has typified Cook’s teams this season. Moreover, with only one natural wide player, Michael Jacobs on the left, the play lacked the balance we have come to expect. Scunthorpe had come into the game with a positive approach, with a willingness to push men forward. In Ivan Toney and Will Hopper up front they posed a constant aerial threat that was to prove the undoing of Wigan’s central defence. Dan Burn and Chey Dunkley have proven close to invincible in the air this season, but yesterday they were caught out, with all three Scunthorpe goals deriving from lofted balls into the area. Burn had been the stand-out player for Latics this season, but in recent games he has looked lethargic and not at his best. Dunkley was at fault for the second goal, not seeming to know where Hopper was as he headed home from beyond the far post. Although they lacked fluency yesterday, Latics did show their fighting qualities. Dunkley had put them ahead after Scunthorpe keeper Matt Gilks had not reached Max Power’s corner. The second and third goals were deflected. Cook is not renowned for his tactical flexibility but chose another option yesterday when he brought on Alex Bruce to play in the centre of a back three. Given the recent porosity of the centre of defence it might be an option that he will continue to experiment with at Bradford on Tuesday. Bruce may lack the pace he had before injury intervened but could be part of a formidable trio with Burn and Dunkley. The FA Cup is once more approaching. Prior to the Manchester City game, Latics were poor in losing to both Southend and Blackpool. At the time we surmised that the players had the big cup match in their heads and just could not apply themselves as normal. Or maybe an imminent takeover of the club was about to happen, unsettling the playing staff. That takeover still has not happened and we can but ponder on what might happen if the Whelan family continues to hold the reins. In the meantime, it leaves Cook and his staff in a vacuum, not knowing if the necessary funding would be available to consolidate in the Championship were promotion to be achieved. With the FA Cup continuing to cast a shadow on Wigan’s league performances and severe dropping off in the form of key players, Cook will surely bring in some fresh blood at Bradford. To make wholesale changes would be a mistake, but some adjustments will need to be made. The manager will also have to decide whether to revert to that 4-2-3-1 system that had served him so well before. Following the victory over Manchester City, Cook’s popularity rating was at a high. However, he faces serious challenges in the coming weeks. Yesterday’s performance was gritty, rather than fluent. His challenge will be in helping his key players get back to their best form. Too many looked jaded yesterday and Cook will need to take a more serious look at squad rotation if the situation is to be rectified.